Sky-high ceilings are created by a sculptural pitched roof. Its uneven angles are the result of the required setback distances from surrounding roads and houses. Playfully protruding and recessed windows define the street-facing side of the house, maintaining privacy while ushering in sunlight. A series of large glazed windows face the backyard garden. Thanks to its timber frame and simple design, House B was built in less than six months. In the top floor study area, a pair of Copenhague Desks by Ronan & Erwan Bouroullec for HAY are stationed below a Sax hanging light by Vertigo Bird. White polyurethane floors create the illusion of increased space, and add brightness and depth to the interior. A family of Eames Molded Plastic Side Chairs surround a Loop Stand High Table by HAY in the dining area. Aplomb suspension lamps by Foscarini, a Smeg stove, and an oblong Cut vase by Studio Minotti for Bosa adhere to the home’s black and white color palette. The underside of the home’s timber floors are left exposed, creating geometric wood ceilings for the rooms below. FRdesign’s pared-down Mass sofa maintains a quiet presence in the living area. Custom built-in furniture takes design cues from the home’s timber frame. The staircase and all built-in storage objects are made of wood. Two black wood units separate the stairwell from the living room and kitchen. 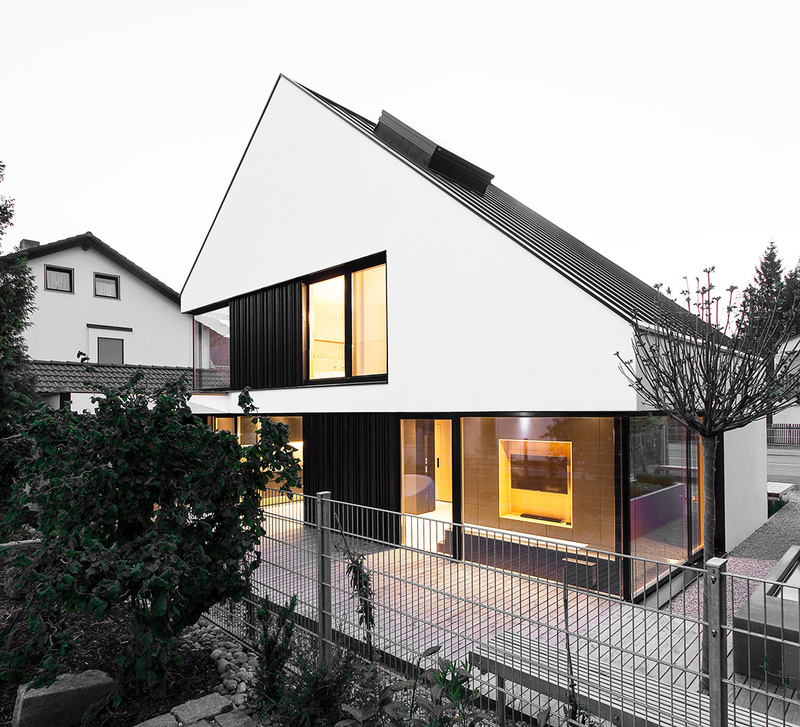 Built on a small site in the outskirts of Munich, House B provides a smart solution to the region’s public construction restrictions, which reduced the available building area to one-third its size. Robert Maier and Stefan Hanninger, co-founders of the German firm Format Elf Architekten, maximized the amount of living space in the 2,690-square-foot home by creating open, unobstructed interiors punctured with windows for constant natural light. An asymmetrical pitched roof covers a high-ceilinged lounge that gives way to bedrooms and bathrooms on the second floor. An open-plan kitchen and living area occupy the ground level, where glazed windows offer sweeping views of the backyard garden. Custom built-in furniture, championing the home’s pared-down aesthetic and muted color scheme, ensures everything has a place.